Dermaplaning is a painless procedure and our clients have found it very relaxing with glowing results . The treatment is completed with a moisturiser or serum to suit your skin type and an SPF to protect your skin from UV damage. After the Dermaplaning treatment we will use an enzyme peel, followed LED light therapy and finish by a soothing hydrating mask which will help to further your results. While the mask is working you can lie back and enjoy a relaxing neck and shoulders massage. 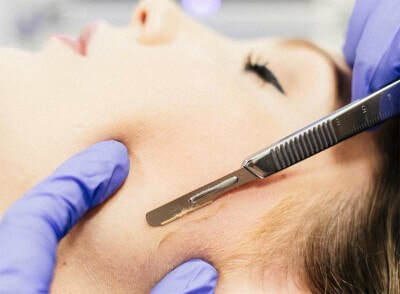 This treatment is an extended version of the Deluxe Dermaplaning. After the Dermaplaning treatment we will use an enzyme peel, followed LED light therapy . We will then will use a mask followed by a Coollift treatment. This is the ultimate in facial treatments and will temporarily take a years of your look with the added bonus of younger, healthier glowing skin. Perfect for a special occasion.